Professionals are able to claim a concept (something they are researching or thinking about) and attract interested parties through a network. The best ways to distinguish the concept is to create a hashtag, something all of the social media platforms use for conversations. Of course, a traditional search in social media or Google on the concept also works. Once there is a following, you have effectively created a feedback loop – an effective way to collectively build a concept. Your network also feeds you relevant content, stuff they have created or curated. Intelligent systems also feed you content through algorithms. Because of the massive amount of content produced on a single day, you cannot read everything. Much of your ‘daily knowledge gain’ is based on what content is fed to you. Many of us get our daily news from Twitter and Facebook. 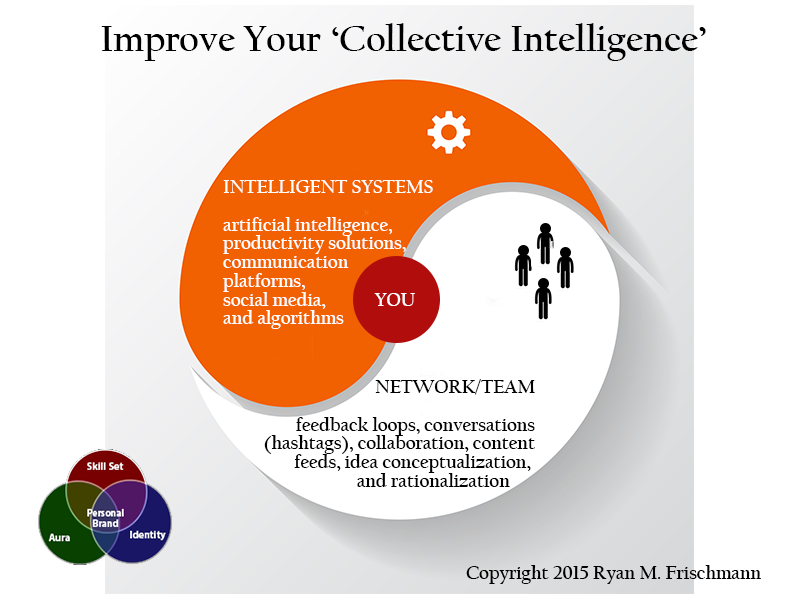 The takeaway is leaders should improve the ‘collective intelligence’ of their teams. Introducing new technologies and applications could be an effective way to improve this ‘collective intelligence’. Moreover, they should create a structured environment where all team members have equal time to share their ideas. Perhaps flatter companies where team members have an equal voice and status is the optimal structure; this is something the authors harp on in A World Gone Social. Social networks and technology make it possible to do all of this virtually. In the future, ‘collective intelligence’ will be more commonly referenced than ‘individual intelligence’. Intelligence in all its forms relates to personal branding. Think about it. In an evaluation of a person’s reputation (personal branding is synonymous with reputation management in many ways), two things always come up: that person’s smartness and how well he or she works with others. Your maximum level of expertise with a skill set is largely determined by your individual intelligence (and to some extent your collective intelligence). Your identity and connectedness defines what networks you can tap into to maximize your collective intelligence. [i] Ted Coine and Mark Babbitt (2014). A World Gone Social: How Companies Must Adapt To Survive. New York: AMACOM.